drip Archives - Fix Your Own Refrigerator Issues! Fix Your Own Refrigerator Issues! I Can Help You Can Fix It! Dripping or Leaking Water Dispenser? Published December 31, 2017 / by Cassidy / 5 Comments on Dripping or Leaking Water Dispenser? If your refrigerator water dispenser recently started leaking or dripping water slowly then you might have an issue with water valve. Some refrigerators use a dual water valve like the WR57X10032 water valve one for the ice maker and one for the water dispenser. Therefore it is possible that the water dispenser is working fine but the ice maker is not receiving water or vice versa. Fortunately, the latest water valves have a very simple installation a new style push on fittings for water outlet line and a screw on compression for the water inlet fitting. These new valves cost under $40 and can be replaced in a few minutes. 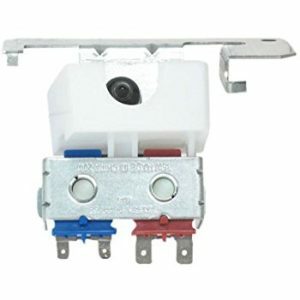 Depending on your refrigerator model, we recommend the WR57X10032 water valve which replaces the older 880070, AH304374, EA304374, PS304374, WR57X10040, WR57X10064. This is a GE Factory Part but GE brands include General Electric, Hotpoint, RCA as well as various appliance models for Sears / Kenmore. Simply enter the model of your refrigerator in the search tool at the top of the Amazon page to ensure it is the correct water valve for your model. Tell us if this worked for you below so we can help each other solve these frustrating refrigerator issues! GE Refrigerator Not Making ICE? GE Refrigerator or Freezer too Warm? Ice Dispenser Door Stuck Open? GE Refrigerator Ice Maker Stopped Working? GE Refrigerator Quit Working – Not Cold? LG Refrigerator Change Water Filter Light On? Maureen Cohen on Is Your Refrigerator Water Dispenser Line Frozen? Maria on Is Your Refrigerator Water Dispenser Line Frozen? Mikey Kocijjan on GE Refrigerator is Not Cooling? Tiffany W on GE Refrigerator Water Dispenser not Working? John on GE Refrigerator Water Dispenser not Working? Mike on GE Refrigerator Water Dispenser not Working?